Paul argues that CLNC is/was the most rewarding project we have ever taken on. That would be unfair to all our other clients, but certainly the complexity of our work responsibilities swamps (pun intended) everything else to date. For those who don't know, what is now the Cape Jourimain National Wildlife Area was a series of islands, wetlands, estuaries and beaches over which Prime Minister Diefenbaker started the ill-fated causeway to PEI. Trudeau nixed it. Too late. The incredibly sensitive ecosystems between the mainland and Jourimain Island had been overrun by massive earthworks for a new road to nowhere. Paul remembers driving out there as a university student along the abandoned roadbed to the beaches of Anne's Acres and the Jourimain lighthouse. 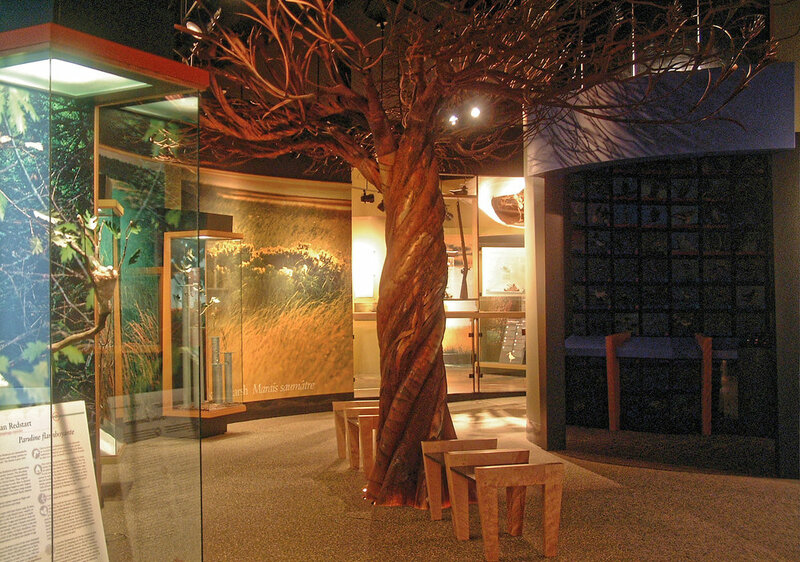 Years later, over a bottle of scotch, the concept of a permanent interpretative centre at Cape Jourimain was conceived. The decision to build a bridge to PEI had been made in 1991 in favour of Straits Crossing. The federal government committed funds to support the New Brunswick community of Bayfield and surrounding area. George Finney, then Regional Director, Atlantic Canada for Canadian Wildlife Service and irrepressible visionary saw the possibility of an interpretative and research centre nestled under the wing of the new bridge. He had little trouble selling Paul on the idea (the scotch helped). Many years later when George had worked his magic and as his team garnered the support of the larger Bayfield community, the funds were put in the hands of the Cape Jourimain Nature Centre board. We were retained to help refine the conceptual plan in the late '90's. We went on to propose an interpretative plan and engage with the architects on the entire project. I'm sure you've heard of the iceboats at Québec City? They cross from Levis to Québec during the crushing ice of the St.Lawrence in winter. Imagine crossing three times that distance in white outs with no large community on either side and a bunch of ne'er-do-wells pushing and prodding small boats across. Thirteen kilometres. Imagine the courage it took to get in the sixteen foot open boats? Back up 100 years. Well more or less. Acadians forced out of Nova Scotia and the New Brunswick border lands had to give up/co-exist with Loyalists and their imports. The Acadians had done all the fundamental dyke works that were converting intermediary flood lands into productive fodder. The Loyalists were more ambitious and aggressive, They tamed the margins with huge reinforced earthworks doubling the arable land. They also drove out the Acadians or made them the equivalent of serfs. Back up 500 years. These islands were harvesting and temporary village settlement areas for First Nations. Mi'kmaq certainly but also adversaries such as the Iroquois, and were so for more than 5,000 years. There are numerous shell middens and other bits of evidence. Today, the Area contains about eleven distinct ecosystems with overlapping hybrid zones. All of them extremely sensitive to social or environmental interference. Our Interpretative Plan laced together two storylines: one a chronological history, the other the ecosystems identified throughout the exhibition by 'signature birds' one iconic bird species characteristic of each zone. Given that at the time we installed, internet was still only accessible by ethernet, there is a lot of technology in the exhibition. Many stations had motion audio. 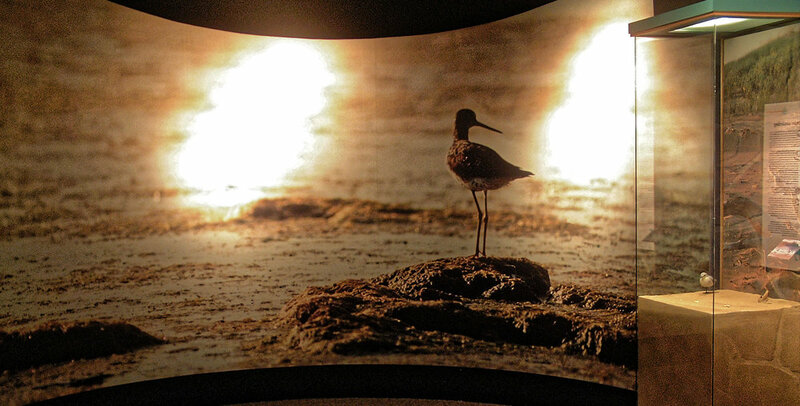 The Ornithology Room catalogues every single birds species using a control console that activates a wall of lightbox images. The Migration Well activates video sequences showing migratory behaviours of the 12 Signature Species. 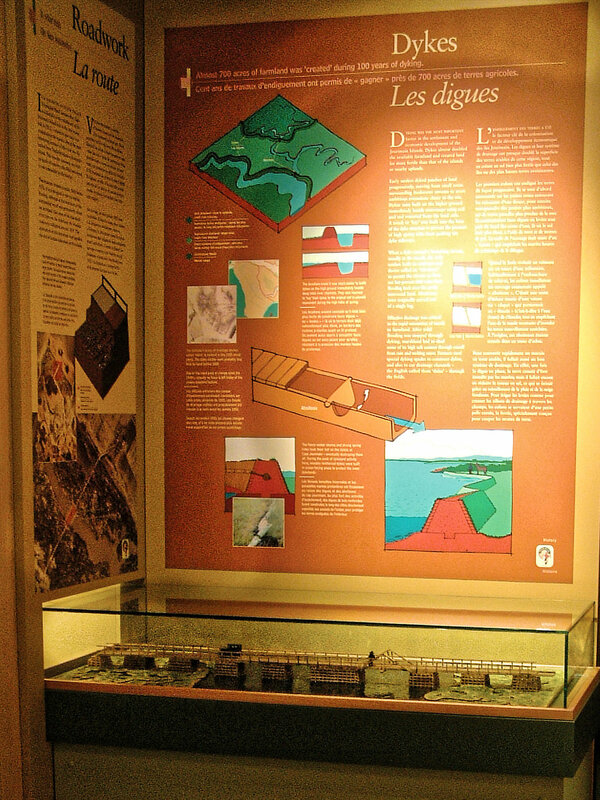 The exhibition in in English and French with portions in Mi'kmaq audio.